Is a painter's work ever complete? For most artists, an oil painting, water colour painting or pastel painting eventually becomes a piece of quality artwork. Gordon Stones from Melbourne, Australia has completed many pieces of artwork on various surfaces over the past five decades. 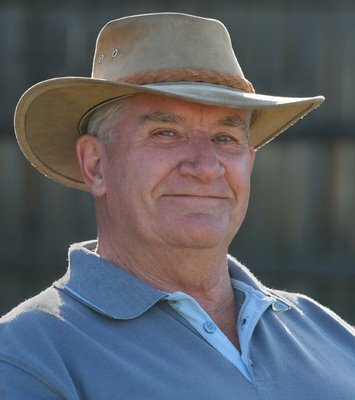 Commencing as an apprentice painter and decorator in 1956, Gordon plied his skills of the trade to various buildings in and around the suburbs of Melbourne, using brushes of various dimensions and textures. These days his motivation for turning to the canvas is his continued desire to express his creativity with colour, but without the strain of continually climbing a ladder. Currently, he is painting a church scene on canvas-covered board using acrylic paints. “This is actually a painting of the Catholic church in the town of Bled, which is situated on Lake Bled in Slovenia,” Gordon said. Having retired from his life-long occupation, Gordon now has more time up his sleeve to have multiple works in progress. “This other painting I’m currently doing, is of the blacksmith's shop and shipwright's workshops at the maritime centre in Warrnambool," said Gordon. Gordon’s paintings are reasonably priced and they are professionally framed by a local framer. His favourite painting medium is acrylic, as he finds it easier to work with as compared to watercolour, which he stated is more demanding. 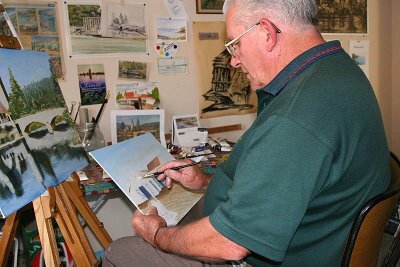 Gordon undertook 12 months of formal painting training with a local art teacher in 1999, and is now considering further tuition to enhance his ever-improving skills with the small brushes. Authors note: Gordon and I collaborated on a painting about four years ago. 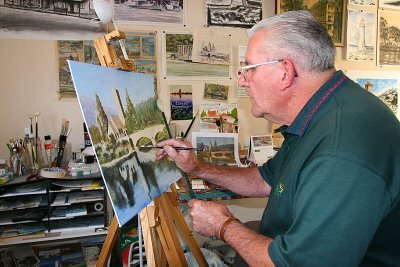 I took a photograph of a well-known Melbourne bayside location and Gordon went on to paint that scene on canvas-covered board with acrylic paints. The painting he titled ‘The Bluff’ proudly hangs on his family room wall. It’s one of the most spectacular pieces of coastline in Australia and it’s located in the southern mainland state of Victoria. The Great Ocean Road, which stretches from Torquay to Warrnambool, is a 300 km journey that provides visitors with breathtaking scenery from start to finish. For those who undertake a day trip, stay for a weekend or crawl their way through the many nooks and crannies, the experience is something to savour. 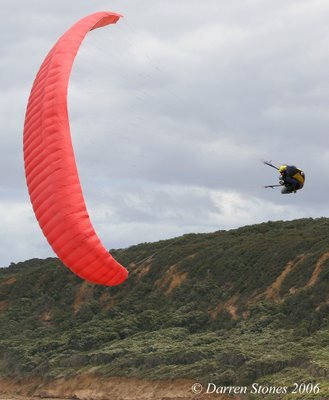 A day trip on a weekend is common amongst many visitors to this region and Ethan Glessich from Teesdale was visiting Bells Beach near Torquay and partaking in his favourite hobby of paragliding. Ethan had travelled 80 kms with his brother for the day. 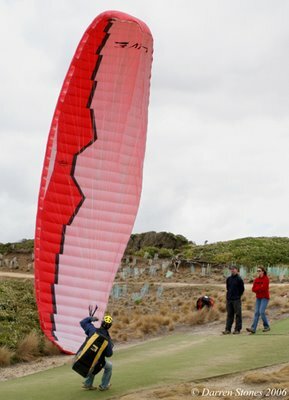 “I come down here once a week or once a fortnight, depending on the weather to paraglide along this stretch of beach as it’s the closest location to home,” he said. Ethan said that when the parachute is filled with air, it places a great deal of strain on the harness and his body before he lifts off. Once airborne there is no further strain on him and he just goes along for the ride. 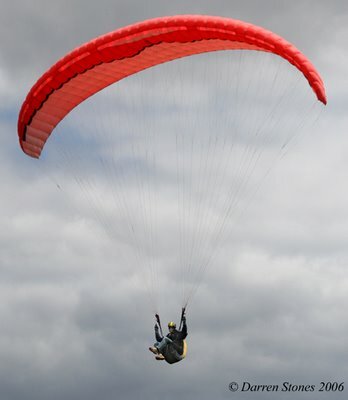 A young couple from Geelong was also visiting for the day and they were keen paragliders but felt the wind conditions needed to be a little more favourable for them. They were considering moving along the coast to another location where wind conditions may have been stronger. 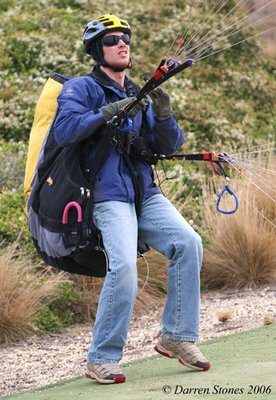 Interestingly, the cost of a parachute and harness as used by a paraglider costs around $5000AU. Further along the Great Ocean Road at Lorne, I met another day tripper from Melbourne who was beach fishing with a friend at the eastern end of the main beach at Lorne. 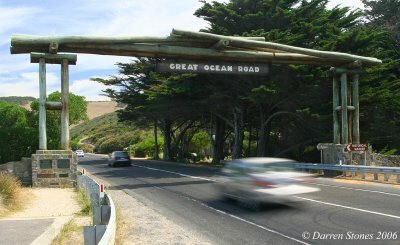 The Great Ocean Road provides numerous activities for many people. 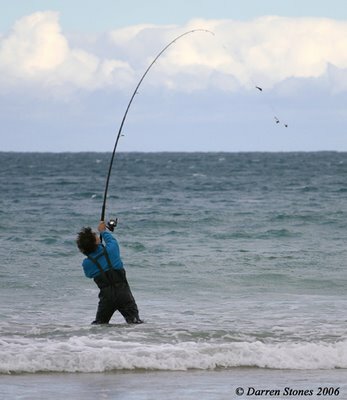 Paragliding and fishing are two hobbies that are actively pursued along this marvellous piece of coastline.